There are a lot of wedding photography awards programmes out there – even a few different “wedding photographers of the year” in any one year. Each programme has different criteria, and different types of judges. I like entering awards to push myself to continually improve my photography, so for me the most valuable awards programmes are those where fellow professional wedding photographers judge the photographs based on criteria of creativity, technical ability and impact. 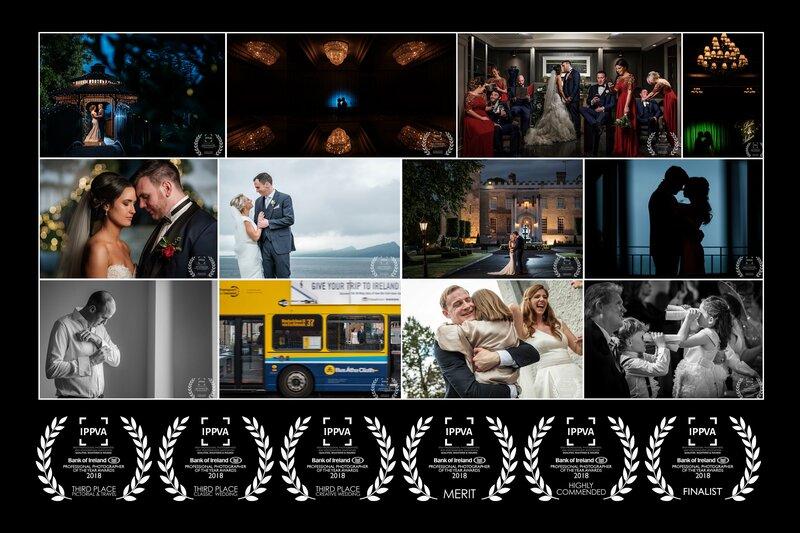 I’m proud to be an active member of the Irish Professional Photographers & Videographers Association (IPPVA) and even more proud to have participated in the IPPVA Awards programme for the last few years. What makes this programme unique is that it is judged anonymously, online, by a panel of professional wedding photographers, all accomplished in their own right, some based in Ireland and some based internationally. It is judged across 4 heats in a year, with an end-of-year judging that involves an international panel of judges assessing printed versions of the images. I don’t know of a more thorough photography awards out there. I was, therefore, absolutely thrilled to be placed 3rd in three categories at the IPPVA Irish Professional Photographer of the Year Awards this year. I was awarded 3rd place in Classic Wedding, 3rd place in Creative Wedding and 3rd place in Pictorial & Travel. I was also a finalist in the Documentary Wedding category. I’ve previously been a finalist in the awards, but this year was my first time receiving a prize (or, rather, three prizes). I’m also proud to have now clocked up 50 (and counting!) individual awards in that programme since my participation started a few years ago. You can see all the award-winning wedding images from the last few years below. I look forward to growing this gallery!